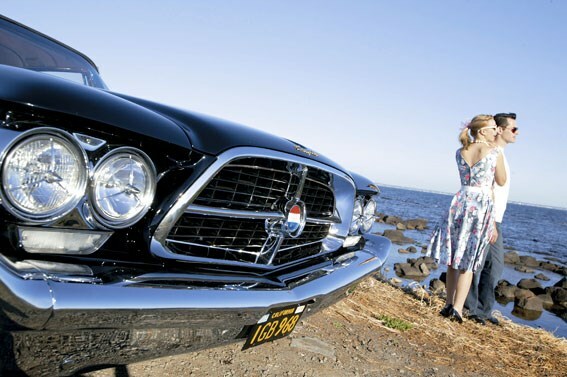 "Watch out for those tail fins," warns Emilio Giannarelli, the owner of the immaculate Chrysler 300F as the photographer gets too close to one of the soaring fins. "I’ve injured myself on those before – they’re very sharp." 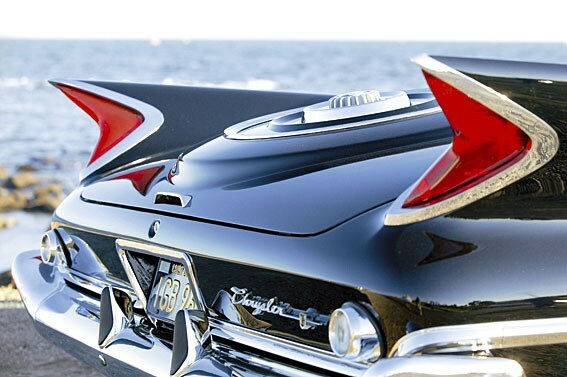 I step in for a closer look, and sure enough, those massive fins, designed by Chrysler stylist Virgil Exner and some of the most striking of any ’50s or ’60s American car, look sharp enough to impale an apple – or unwary photographer. We’re at Williamstown foreshore just outside Melbourne’s city centre on a balmy summer’s evening. As the sun slides lower in the west, low-light sparkles across a dead-calm Port Phillip Bay and dances in the black mirror finish of the ostentatious 43-year-old classic. Frolicking in the background our two young models, resplendent in tough guy t-shirt and Valley Girl dress, could have come straight from a James Dean matinee. P-plated Commodores and Valiants, piled high with friends enjoying this popular cruising spot, stop by regularly to admire the scene. One guy asks "Are you shooting for a Pepsi advertisement?" It’s picture perfect, the ideal photographic location to capture a rare American beauty. One of about 100 believed to still exist, including four in Australia, the 300F is a novel sight on public roads today. Our example is also one of the finest, the subject of a no expense spared, ‘nut and bolts’ restoration by its current Melbourne owner. For many Mopar fans the 300F is the pinnacle of the so-called ‘Letter Cars’ built by Chrysler from 1955 to 1965. 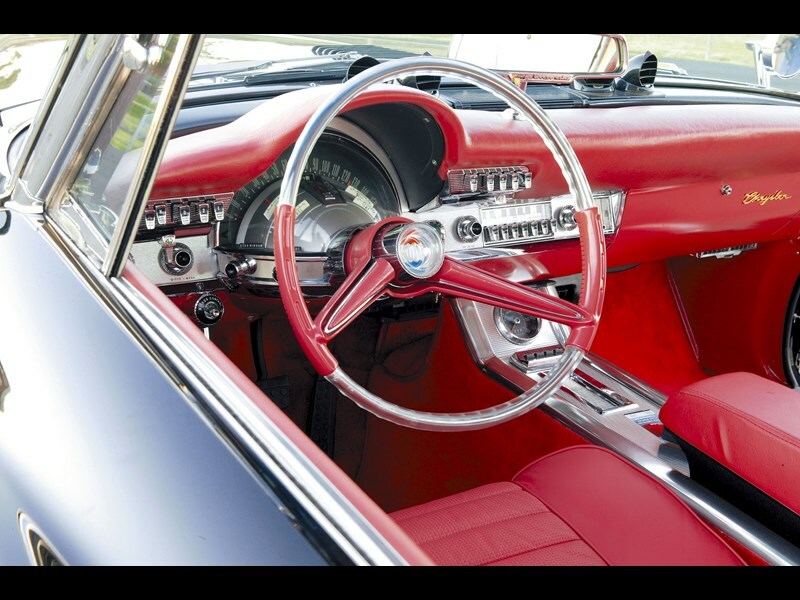 Marketed as limited-edition, luxury high-performance cars the 300 series were notable as much for performance as parading, blending big-block power with cutting-edge styling and glamorous interiors. America’s most powerful and fastest production cars for a number of years, they were often referred to as ‘Beautiful Brutes’ and the ‘Bankers Hotrod’. The first 300 caused a commotion when it arrived in 1955. 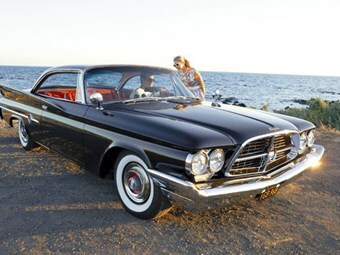 It appeared as a classy two-door hardtop with full leather interior and stylish grille. The 331cu.in Hemi V8 engine under the bonnet created the most excitement, however. The free-breathing Hemi-shaped head, four-barrel carburettors and large exhaust made it the first American road car to reach the magical 300 horsepower mark. The 300 quickly fulfilled its performance promise, breaking the speed record at Daytona Beach in Florida and taking out the coveted NASCAR Grand National championship in ’55. The 300B arrived in 1956 to further enhance the ‘gentleman racer’ image. Thanks to a larger 354cu-in Hemi V8 producing 340bhp (253kW) it went on to break the world passenger car speed record, averaging nearly 140mph (225km/h) down Daytona’s sandy straight. The 300C of 1957 went a step further with two new hot engines, a 392cu-in (6.4-litre?) V8 with 375hp, or drag-racer version with 390hp. The ‘C’ also saw the arrival of the tall Exner-designed fins that would evolve into the sleek canted versions on the 300F. 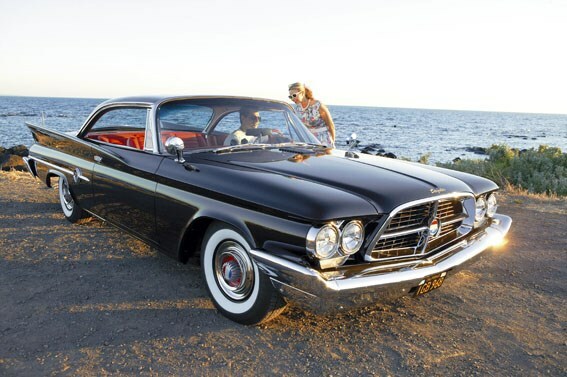 By 1959, the Firepower Hemi had been replaced with the 413cu-in V8. Although it lacked the mystique of the legendary Hemi, the new 375hp ‘Wedge’ V8 in the 300F used a unique cross ram induction system used by drag racers for an added boost. 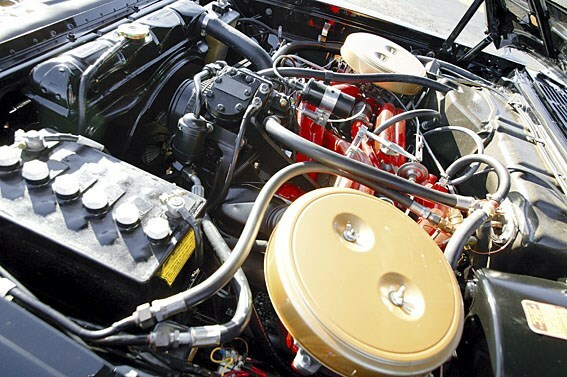 The two, four-barrel carburettors were placed on either side of the 6.8-litre engine feeding the opposing cylinders through long intake manifolds. The end result was a wall of torque – 656Nm -unleashed at lower revs for greater driveability. According to Emilio, "The ram induction comes in at 2700rpm and when you plant the foot it throws you right back in the seat!" Cars’ magazine clocked the 300F for the 0-60mph (96km/h) sprint at 7.4 seconds and registered a top speed of 135mph (217km/h). Not surprisingly, the 300F like its predecessors went on to set new flying mile records at Daytona Beach. The 300F was the first of the ‘Letter’ series to feature monocoque construction. Measuring almost 5.5 metres long and 2.0 metres wide, the exterior styling continued the ‘Forward Look’ developed by Exner. 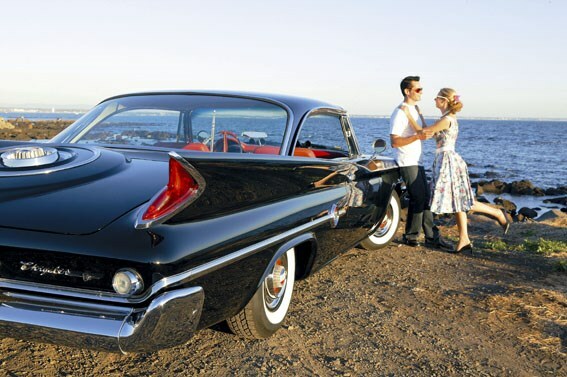 But unlike other big Chryslers minimal chrome down the side helped accentuate the strong, flowing lines and slanted tailfins, which started halfway along the door and ended in boomerang-shaped taillights. Other distinctive touches included a chrome-cross grille, subtle bonnet slats, and fake spare-wheel cover on the boot lid borrowed from the Imperial. A total of 11 bold ‘300F’ badges both inside and out left admirers in no doubt about the Chrysler’s top-dog status. Adding to the long, sleek appearance was a suspension set lower and firmer for improved handling. There was the choice of rear axle ratios and limited slip diff, but keen drivers had to make do with 12-inch drum brakes, power-assisted, to pull up a hefty 1940kg. Emilio’s car has the standard Torqueflite three-speed auto, but a few cars were fitted with an optional French-built four-speed manual and more potent 400hp engine. It’s these cars, especially in convertible form, that are most prized amongst collectors. A special interior design set the 300F further apart from other upmarket Chryslers. Seating was for four only, with individual leather-lined bucket seats divided by a centre console running right down the middle. A 7000rpm tacho, almost hidden from view of the driver, sits in the aluminium-covered console alongside the power window switches, and ashtray. The long list of luxury features include electric front seats that swivel for easier access, power steering, air-conditioning, heater, touch-tune radio, rear speaker and ‘Mirrormatic’ rearview mirror with auto-dipper. The interior highlight, undoubtedly, was the ‘Astradome’ instrument panel. A series of gauges on a small dome appeared to float before a large semi-circular 150mph speedo. Switches placed around the lower edge of the plastic-covered pod gave the whole system a real ‘Buck Rogers’ feel. Electroluminescent lighting, powered by a special 12 volt transformer, lit the panel at night with a soft turquoise glow. Just the thing to impress a hot date! Priced from $5411 the limited-edition 300F was only available to a lucky few. 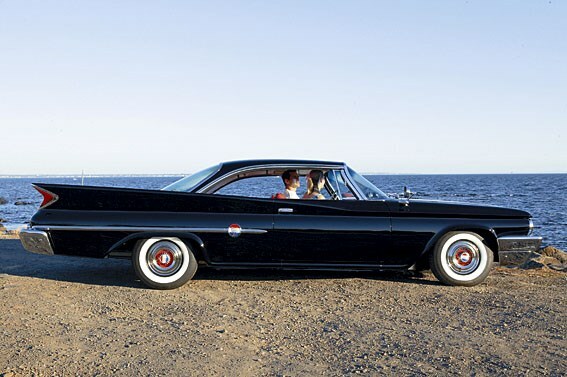 Still, it sold well for a ‘Letter Car’, with 1212 built in 1960 – 964 hardtops and 248 convertibles. All this was yet to be discovered by Emilio Giannarelli when he began trawling U.S web-sites in 2000 for his own American beauty. A stonemason by trade, Emilio grew up around Yank tanks, his brother owning a Cadillac Brougham and Stutz Blackhawk. Intrigued by a few 300F cars for sale on US classic car websites, he tracked down the owner of a Terracotta 300F hardtop in Melbourne for more details, and soon had his mind set on buying one. Most of the few cars for sale were in poor condition, filled with rust, but he eventually found a white hardtop for US$14,000 and shipped it over to Melbourne. On arrival he found it "tired but running" but more importantly complete – it even had the original rego plates. The body was in good condition with minor rust in the sills and around the boot. By now realising the high prices being asked in the US for fully restored cars, Emilio decided to go down the full, body-off restoration route. The body went out to File Finish in Melbourne who over a period of 18 months stripped it back to bare metal, cut the rust out, fitted new steel sections and finished with a coat of two-pack black tinter mix. The finished paintwork is so deep and lustrous you could shave in the reflection. All running gear was rebuilt or replaced, with local big-block engine guru Victor Pace getting the job of returning the 6.8-litre engine back to all its musclebound glory. The only modern updates are a lower compression ratio so it can run on premium unleaded petrol, and a conversion from the old unreliable manual choke to an electric system. The rest of the interior and exterior trim, some unique to the 300F, was treated to similar high standards. 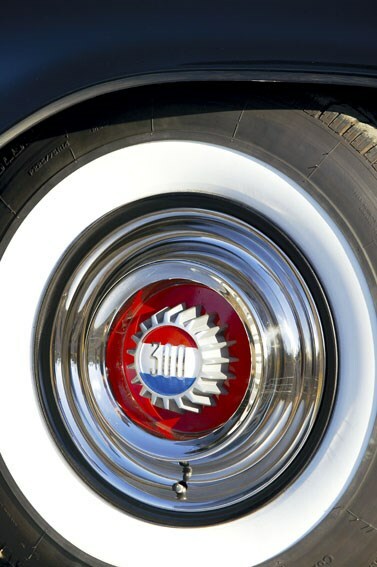 Some items like badges, the moulded steering wheel, chrome and hubcaps could be restored while others had to be replaced. Due to the lack of available parts, some items were fabricated by local specialists such as the brushed aluminium on the side doors and dash and the rear number plate surround which was die-cast out of solid brass. Emilio did most of the final assembly himself, but entrusted the interior re-trimming to the Dashboard Doctor. Originally beige, the seats were re-covered in red basketweave leather and vinyl. While red carpet replaces the old black for a stunning, colour-coordinated look. Emilio found some matching white material from a Volkswagen for the replacement headliner. The car now rides on Coker reproduction 225/70R14 radial tyres, which are a lower profile than the original white-walled nylon versions for better handling. Despite some minor personal touches, the 300F remains faithful to the original specifications; right down to the Golden Touch by Chrysler AM radio in the dash. The Letter series continued to the 300L of 1965, but a drop in performance and exclusivity meant it never again reached the heights of the 300F. A member of the Chrysler 300 Club International, Emilio believes just 100 cars have survived worldwide including four hardtops in Australia.